Isaac Salazar was trained at the California Healing Arts College in 2003 and has been working as a full time massage therapist since then. He has worked with several Los Angeles area chiropractors who utilized his skills with soft tissue bodywork to enhance their clients chiropractic therapy. In his private practice he combines Swedish and deep tissue techniques to create a massage to fit each individual clients needs. 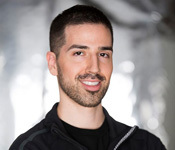 Isaac is excited to join the team at Cotrone Pilates, because in addition to being a CMT he is also a certified Pilates trainer.